HE’S here to inspire and renew life in our parishes. “And I would say most people don’t have that experience. Mr Huntley is known internationally as a leadership coach. 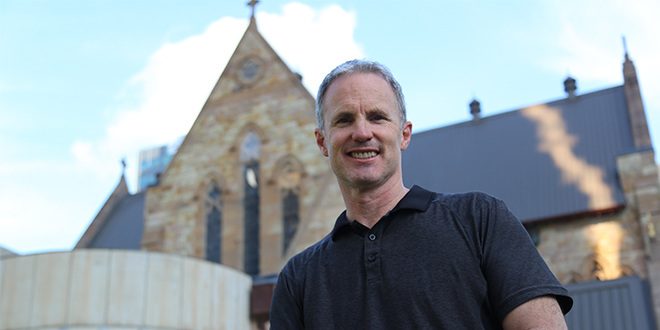 He advocates a parish tool for evangelisation known as Alpha that aims to shake up the status quo, to make priests feel they are more than caretakers, and for parishioners to experience authentic community life. He arrived in Brisbane, just as figures made public confirmed a drop in church attendances, and amid what he called “the twin crisis in the Church” internationally – “a crisis of leadership and the sexual abuse crisis”. “Jesus is alive, and the Church should matter,” Mr Huntley said. At the invitation of Brisbane Archbishop Mark Coleridge, Mr Huntley is in Brisbane to speak at three strategic events – a meeting with 90 parish leaders in the Francis Rush Centre, priests in formation and guests at the Holy Spirit Seminary, and at a convocation of clergy from across the archdiocese. “His (Archbishop Coleridge’s) heart burns for parish renewal… and to see people’s hearts ablaze,” he said. “His heart burns to see fruitfulness and changed lives and his pastors living their priesthoods in ways that excite them and ignite them. “In my experience coaching priests all over the world – they love Christ and they love the Church too. Mr Huntley has worked side-by-side with Fr James Mallon to bring about the “divine renovation” of his home parish of St Benedict in Halifax, Canada, turning it into a vibrant, mission-focused community. His parish work has expanded into the Divine Renovation Ministry and he is known internationally through speaking engagements, a popular podcast, and coaching pastors who seek to bring their parish from maintenance to mission. Fr Mallon and Mr Huntley have authored the book Divine Renovation: From a Maintenance to a Missional Parish, that challenges readers to rethink our models of parish life, from membership-based communities to assemblies of disciples of Jesus who proclaim and share the good news. The book articulates practical ways for injecting new life into parishes. “We are all called to the same thing,” Mr Huntley said, referring to true discipleship and leaning in to evangelisation and leadership. “One of the things we really try to help people with is to understand what leadership looks like in the context of the Church. Mr Huntley praises the Alpha program, now used successfully in parishes around the world, as an accessible way to help Christians re-explore their faith. Alpha is already active in about 30 parishes in Brisbane. “I think it’s an awakening,” Mr Huntley said. “Alpha is a great way to explain the meaning of life over dinner, a great video and casual discussion. “For people who have had some experience of Church growing up, we often say they’ve had just enough Catholicism to know they don’t want it, and they leave. “As adults they run into all kinds of things that can lead us in all kinds of directions that don’t bring life. Sometimes we find ourselves doing life in ways that don’t give life, but we don’t know what to do about it anymore. “At the end of the day God is real or he is not, and if he is, you’re going to want to find out a little bit about Him because we’re all going to die. How are we going to spend eternity? “Most of us find ourselves captive to fear, and addictions and just bad choices – and that’s not life and we know it. Mr Huntley said Alpha was “one small piece in a bigger puzzle” of pastoral planning. “We teach people how to lead so that they are not just doing tasks but owning the vision,” he said. He said Divine Renovation stressed the primacy of evangelisation, the best of leadership principals, and a reliance on an experience with the Holy Spirit. “If we are not radically leaning into, and surrendering to Jesus on an ongoing basis and being filled by the Holy Spirit, this isn’t sustainable,” he said.